A Philadelphia police officer is set to lose his job more than a month after he was captured on video critically injuring a narcotics suspect in Kensington. 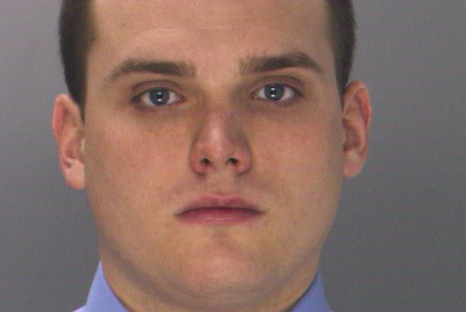 The Philadelphia Police Department announced Friday that 24th District Officer James Yeager had "surrendered himself" to the department's Internal Affairs Unit following an investigation into a July 10 incident on the 200 block of East Elkhard Street. Officers say they tried to make a narcotics arrest of a 21-year-old man and claimed the man actively resisted the officers by swinging his arms and kicking. Ariel Rivera, who reportedly lives in the neighborhood, captured what happened next and shared it to Facebook. The three-minute video shows a violent arrest in which Yeager, 26, first appears to grab the shirtless man and slam him twice against the street, prompting outrage from a crowd that had gathered around the scene. "There's no need for the abuse! You could crack his f*****g skull!" one woman screams. "There's kids around!" yelled another. When officers then struggled to put the man inside of a police cruiser, Yeager is then shown picking up the man and striking him against an above-ground pool. "He wasn't doing anything," another person shouted after officers had gotten the man in the car. The police department gave its account of what transpired in a statement on Friday. On Monday, July 10, 2017, at approximately 12:20 a.m., officers attempted to arrest a 21-year-old male on the 200 block of East Elkhart Street for narcotics. The male was actively resisting arrest by swinging his arms and kicking. Cell phone video footage of the incident was obtained and forwarded to the office of Public Affairs. The footage depicted Officer James Yeager in full uniform grabbing the male after he was handcuffed and forcibly slamming him to the ground; in addition the video shows Officer Yeager place his ASP around the male’s chest, picking him up and swinging him around causing the male to strike his head against the side of a pool. The man was soon taken to Temple University Hospital in critical condition, police said. The police department did not disclose the man's name or give an update on his condition. In an interview with Philly.com, Rivera said run-ins of that nature between city police and residents of the neighborhood happen often. "The reason I recorded it and posted it and pushed for people to share it is because this isn’t something that happens once in a blue moon in our neighborhood," she said. "A lot of people go through stuff like this." Yeager is a four-year veteran of the department, police said.